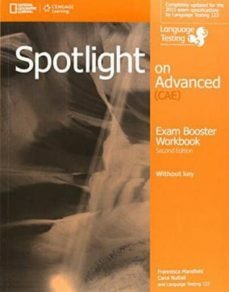 Spotlight on Advanced is a comprehensive course that has been revised to be in line with the new Cambridge English exam specifications for January 2015. It prepares adults and younger learners to excel in the revised exam. An exciting new feature of this revised edition is the Ideas Generator. Test takers need to generate ideas to pass the Speaking and Writing papers of the exam. The Ideas Generator uses National Geographic videos to stimulate students' interest in common exam topics, help them build ideas about these topics and gather the language they need to effectively write or speak about them. After each video lesson students will have a bank of ideas, functional language and vocabulary tied to eight topics that commonly appear in the exam. One of the most difficult parts of the exam for students is the Speaking Test. The Speaking Test videos and worksheets will prepare students by getting them to engage with simulations of all four parts of the Speaking test.